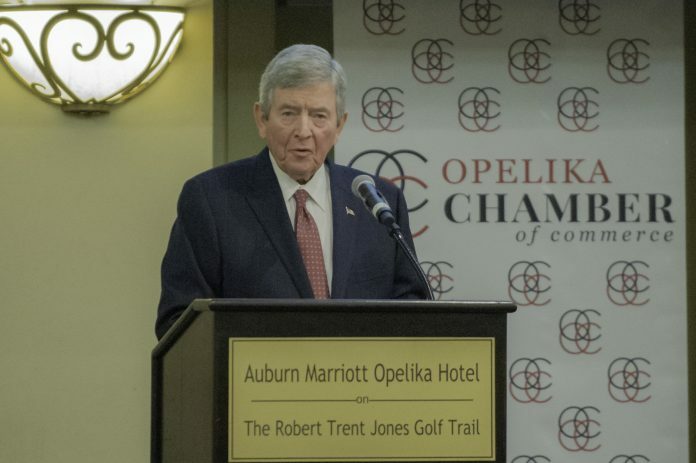 The Opelika Chamber of Commerce hosted Opelika’s Mayor Gary Fuller last week for a “State of the City” address. “It’s my honor, duty and pleasure to share with you the State of the City… what we did together last fiscal year and where the city stands now as we move into the new (fiscal) year,” Fuller said. Opelika continues to see economic growth according to Fuller. “Over the past five years world class companies in Opelika (like Golden State Foods, Car Tech, Aerocosta, Baxter, Mando and others) have invested more than $700 million and created an additional 710 new good paying jobs,” he said. Almost $32 million dollars was collected in sales tax during the 2017-18 fiscal year. The area welcomed two new hotels last year, and also saw a 92-room addition to the Marriott at Grand National. Currently, there are new developments under planning or construction in several locations throughout Opelika, including Tiger Town, USA TownCenter and Saugahatchee Square. Signs of growth often include the construction of new single family homes. “Last year we permitted more than 250 new homes and with more than 115 single family lots ready for home construction and almost 700 more lots under review or development,” Fuller said. The city broke ground on a new police department and municipal court building last year. The project is expected to be completed be the end of 2019 and has a budget of nearly $19 million. The next major project for the city will be the renovation of the Lewis-Cooper Jr. Memorial Library. Director Rosanna McGinnis has worked to increase the programs offered by the library and saw an increase from 144 programs in fiscal year 2017 to 317 in 2018. ‘McGinnis with help from the Library Board and Chair Dr. Cathy Long continues to lead her team in meeting the needs of the community and developing the library as a strong community hub to make Opelika even better than it is today,” Fuller said. The Opelika Fire Department, led by Chief Bryon Prather responded to more than 5,000 calls last year. It is expected that a fifth firehouse will be constructed in Opelika sometime in the future to meet the needs of the community. Mayor Fuller spoke highly of the new swim coach for Opelika’s swimming program. U.S. Olympic gold medal winner Tyler McGill has been busy evaluating, improving and leading the Opelika team, as well as administering a new elite learn-to-swim program according to Fuller. Opelika hosted large, revenue generating events like the Alabama Recreation and Parks Association State Swim meet last year which attests to the quality of the facilities available here in Opelika. The city council approved several major park renovations last year including Bandy Park, as well as a new dog park at Floral. We also graciously accepted a donation from the Stern Foundation for a dog park and walking space for the city. “We are in process of planning renovations and improvements at Covington Rec Center and Shady Park,” Fuller said. The city saw several completed roadway construction projects during the last fiscal year with the largest being the Sportsplex Connector Road, the Cunningham Bridge project and the addition of two new roundabouts at Tiger Town and Auburn Street. The 1st Avenue streetscape plan between North 7th and North 8th Streets, the ADA sidewalk plan and additional roundabouts are all slated to begin this year. The city is working toward completing the Opelika Mobile Wellness Clinic which will be a medically outfitted bus that will be able to go into neighborhoods providing needed basic healthcare such as health screenings, preventative services, primary care and supportive resources to those in need in Opelika. One problem area that Mayor Fuller addressed was the problem of litter on the streets of Opelika. The Public Works department (ESG) has added more crews to better manage litter throughout the city. 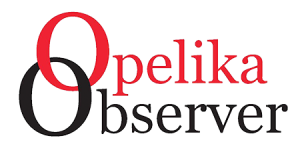 Opelika’s curbside recycling program has 950 customers and most everyone is doing a good job putting the correct materials in their bins however, there have been problems with contamination. Mayor Fuller stressed that those participating in the program be diligent about what they put in their recycling bins. The Environmental Services team will be pushing out a contamination campaign for citizens in the coming months to help address these issues. The Code Enforcement division opened 282 weed cases and closed 252 of those cases. Furthermore, they opened 117 and closed 100 inoperable vehicle cases. Enforcement of property maintenance codes, allowed the city to demolish 18 dilapidated structures, repair six structures and assist in the sale of 12 properties to new owners who are working to repair them. Fuller mentioned the upcoming general election where the county will be voting on the renewal of the education property tax levies. These are not new taxes but if passed will renew existing property taxes to be used for school systems throughout the county. “Please make a note on your calendar to vote “yes” on February 19,” Fuller asked of the audience. In closing, Mayor Fuller stressed that Opelika’s future is bright, but stated that there is always work to be done.